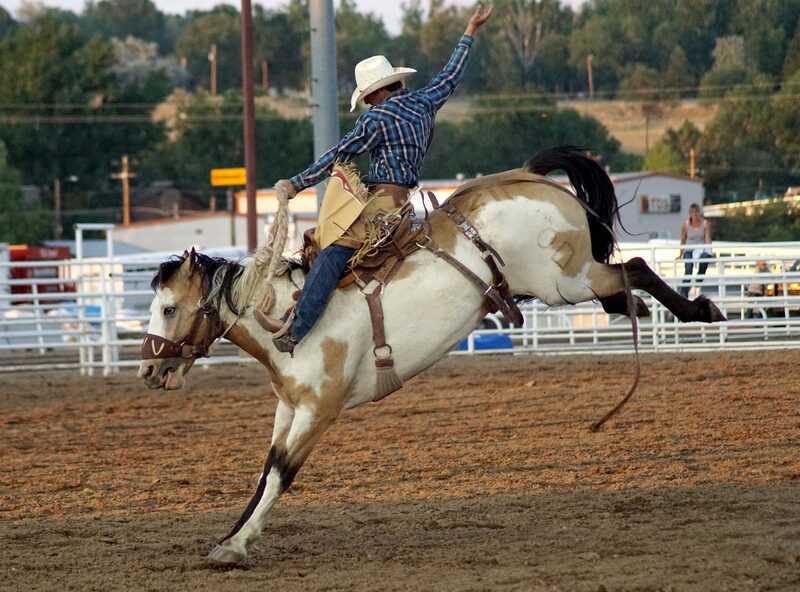 A saddle bronc rider reaches high to keep his balance on a horse determined to unseat him. A bull leaps and twists to unseat a rider. 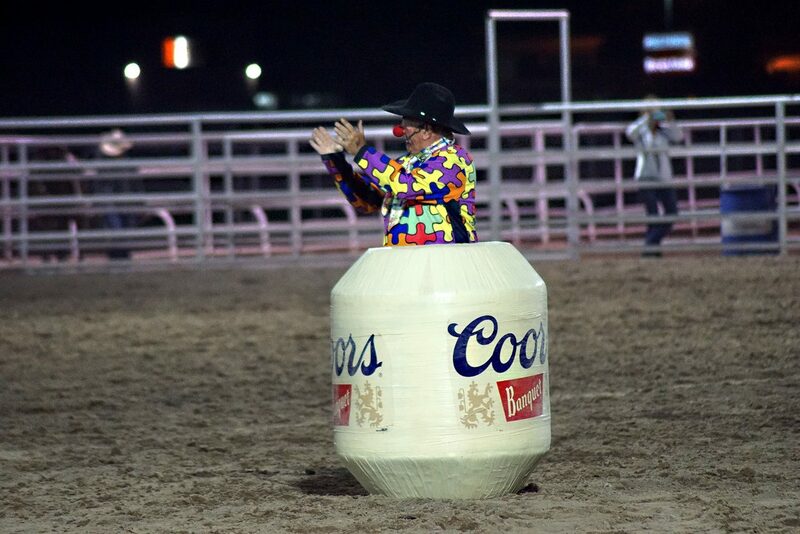 Entertainer Donnie Landis stands in a barrel during bull riding. Team roping at the rodeo. A rider falls to the dirt. 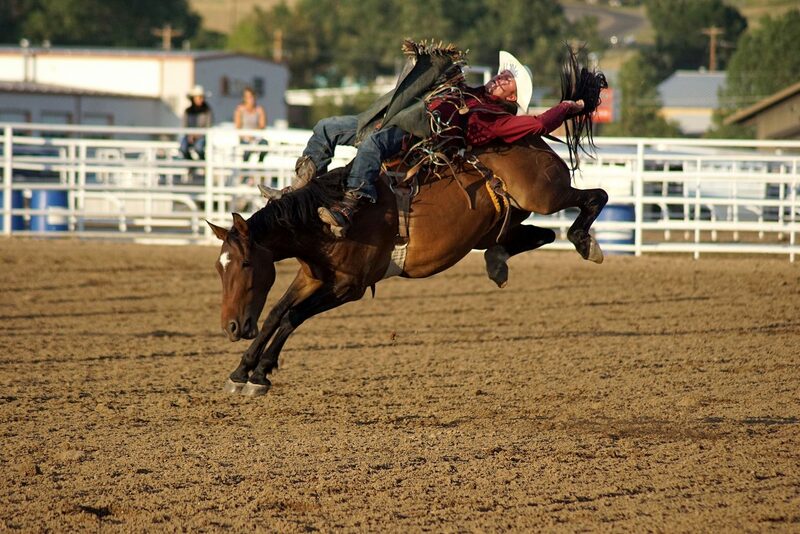 A saddle bronc rider reaches high into the air to keep his balance on a horse determined to unseat him. 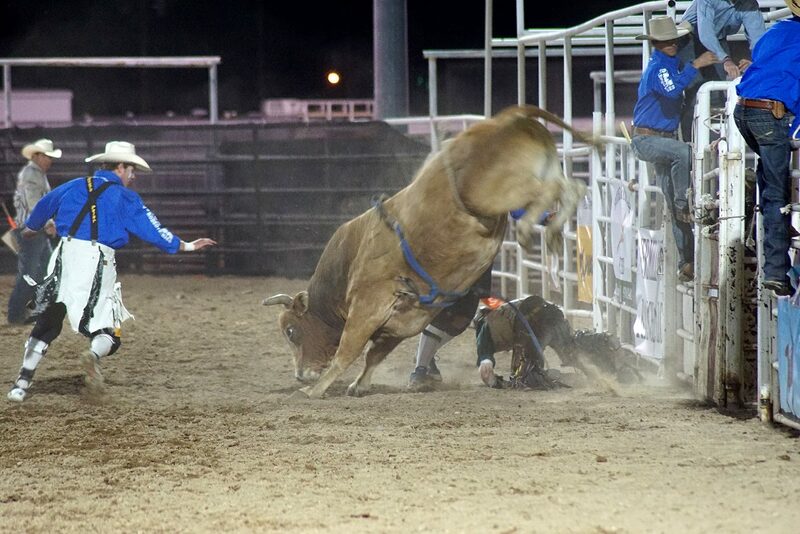 A cowboy clings to the back of a bull working hard to throw him off. A bull charges out of the gate. A Triple V Rodeo bull enters the chutes. 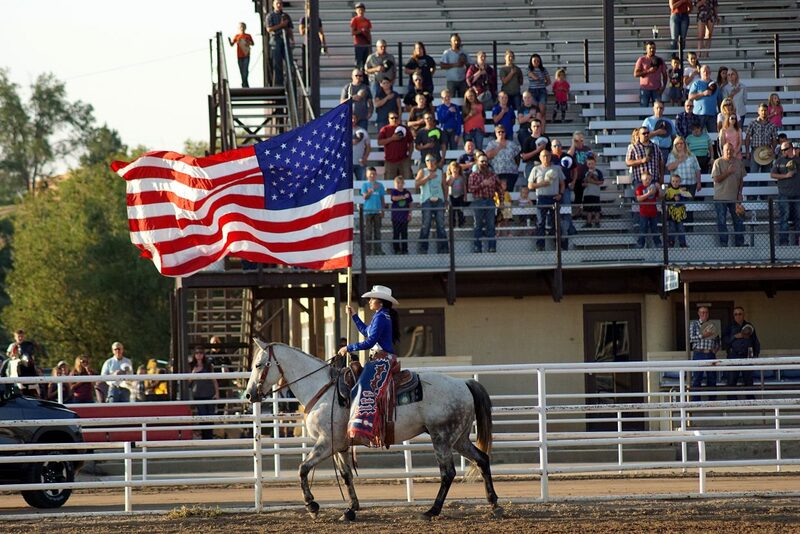 The American flag, carried by Miss Rodeo Colorado Alex Hyland, passes in front of the grandstands Thursday evening. 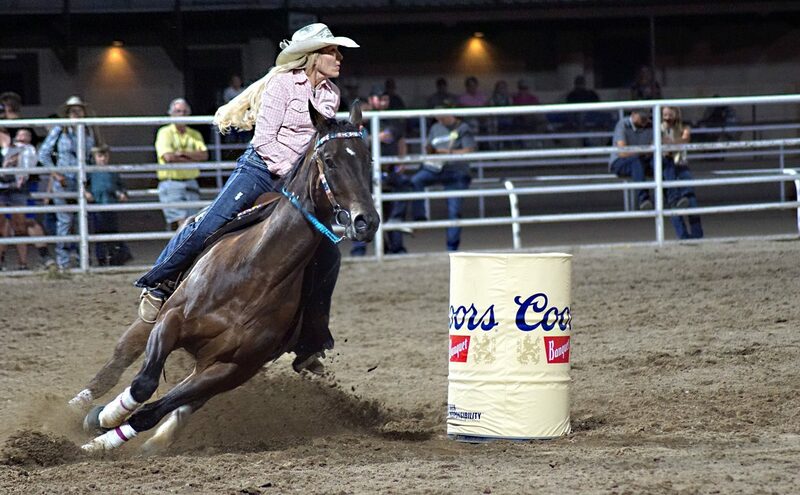 Eight women of the Women’s Professional Rodeo Association show their skill in the barrel racing competition. 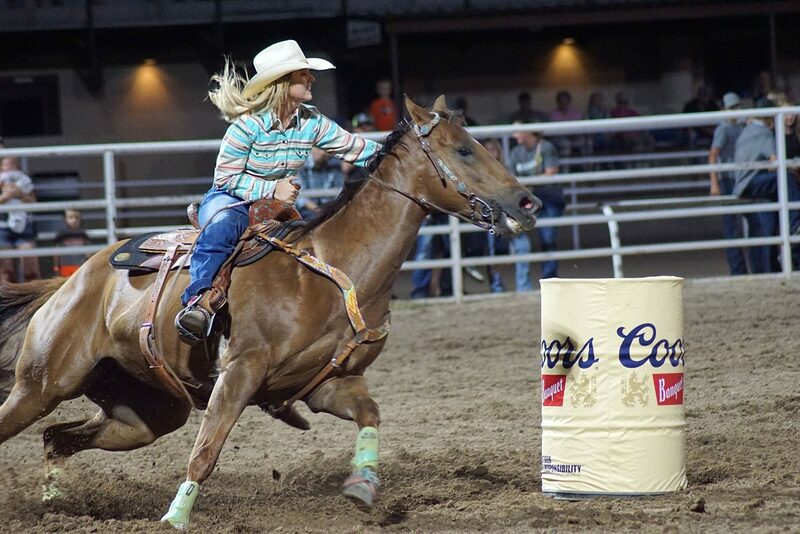 Eight women of the Women’s Professional Rodeo Association showed their skill in the barrel racing competition. 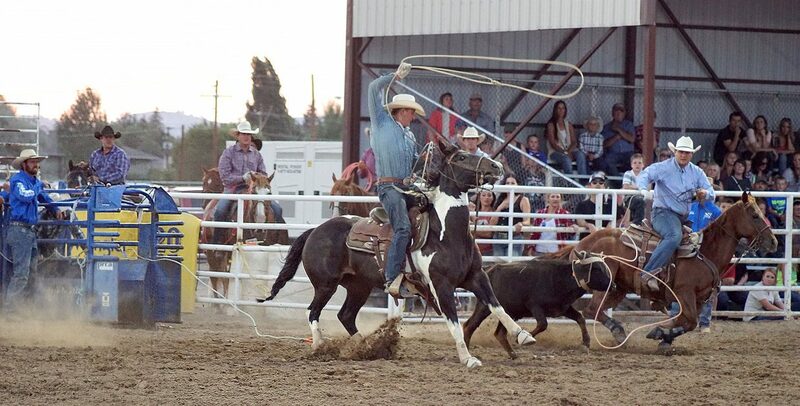 A cowboy watches his horse in the tie-down competition, in which the horses must work independently to assist the cowboy. A cowboy signals he's done during the tie-down competition. 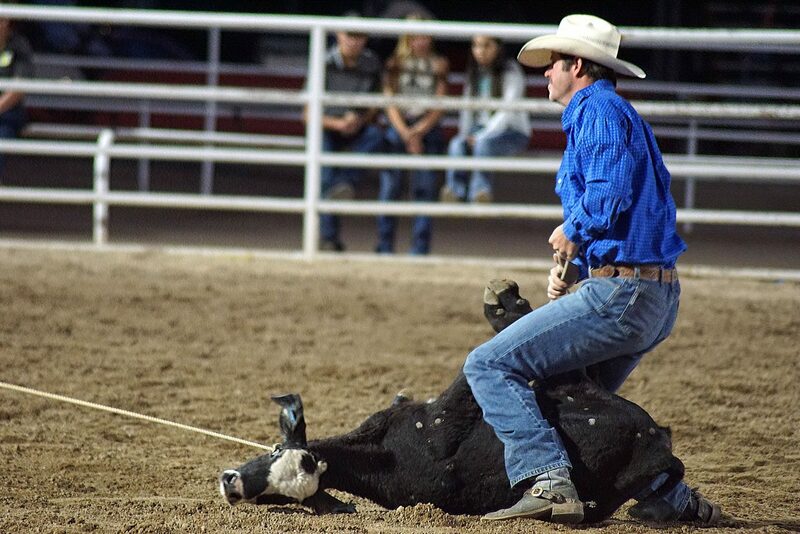 A cowboy races after a calf during the tie-down competition in 2018. 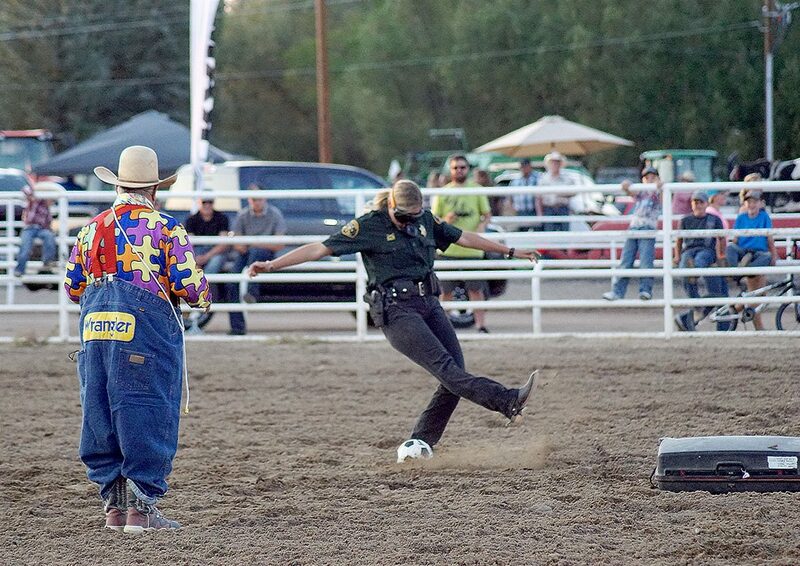 A sheriff's deputy — wearing goggles that simulate the vision of a person who is over the legal blood alcohol limit — attempts, and fails, to kick a soccer ball. The demonstration helped clown Donnie Landis remind the crowd why it's not a good idea to drink and drive. Bullrider in the making? 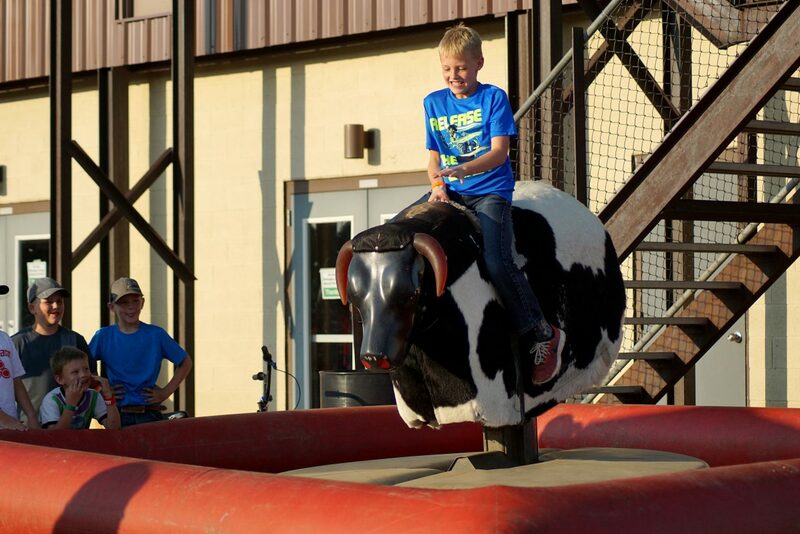 A young man tries his hand on the mechanical bull before the start of the pro rodeo. 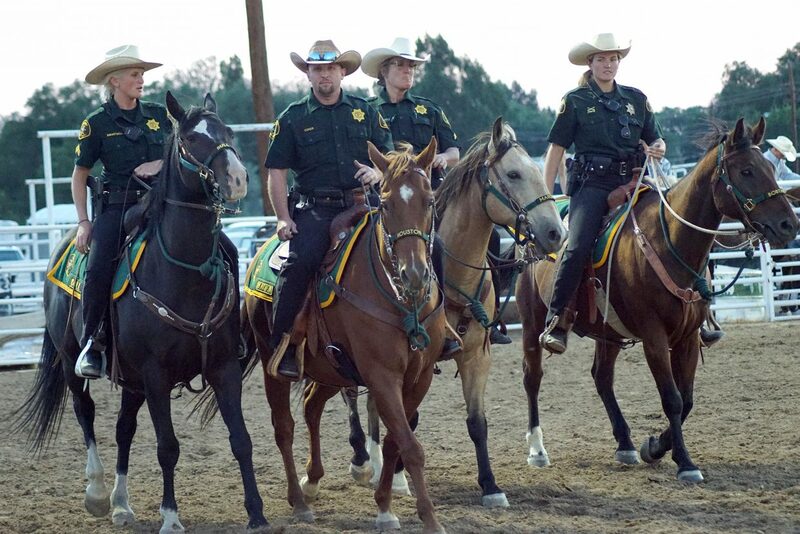 Moffat County Sheriff's Office Mounted Division was among the local first responders honored during the fourth annual Ridin' & Riggin' Days at the 2018 Moffat County Fair on Thursday. 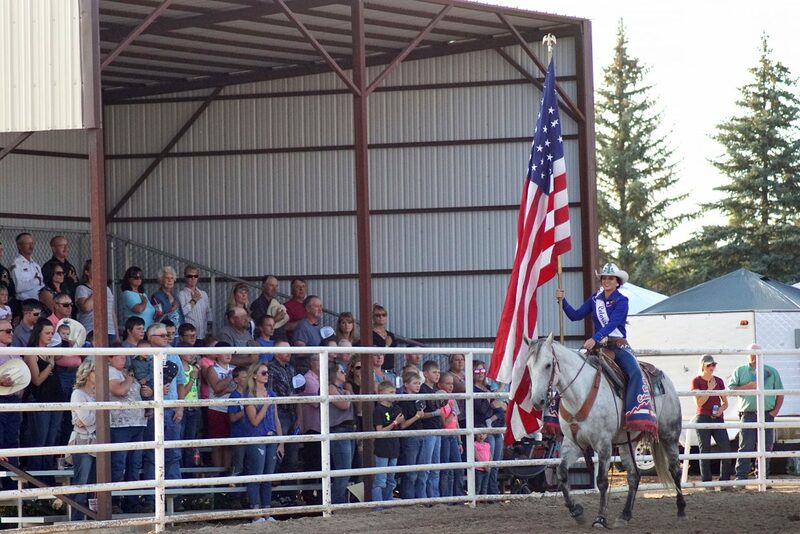 Miss Rodeo Colorado Alex Hyland proudly carries the American flag as spectators pause to salute. 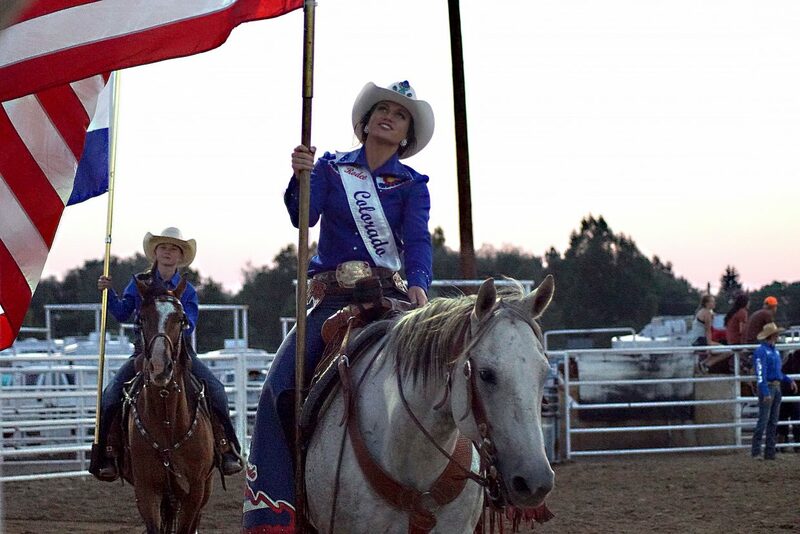 Miss Rodeo Colorado Alex Hyland proudly carries the American flag, as local rodeo royalty rides behind her, carrying the flag of Colorado. 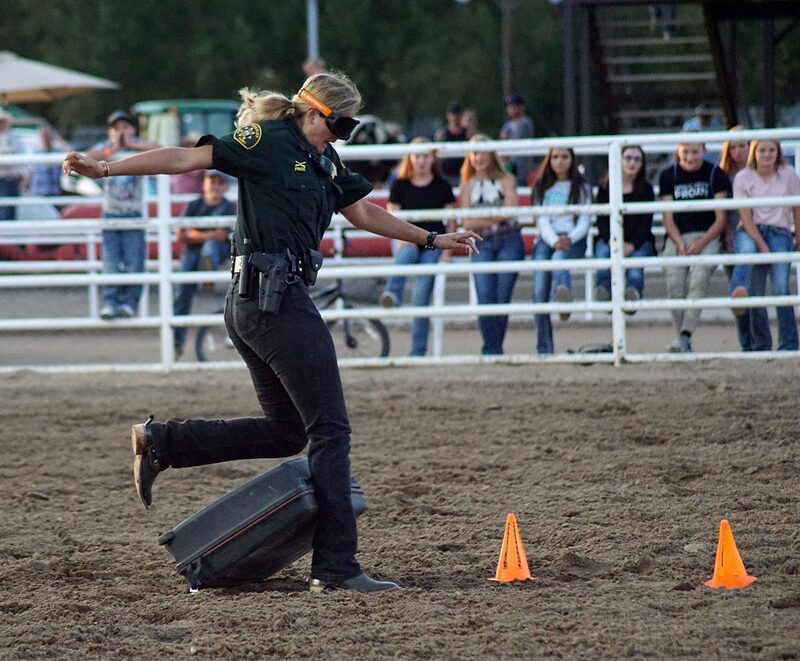 A Moffat County Sheriff's Office deputy from the mounted division entertains the rodeo crowd between events by trying to run an obstacle course while wearing "drunk" goggles. Rodeo clown Donnie Landis entertains the crowd. 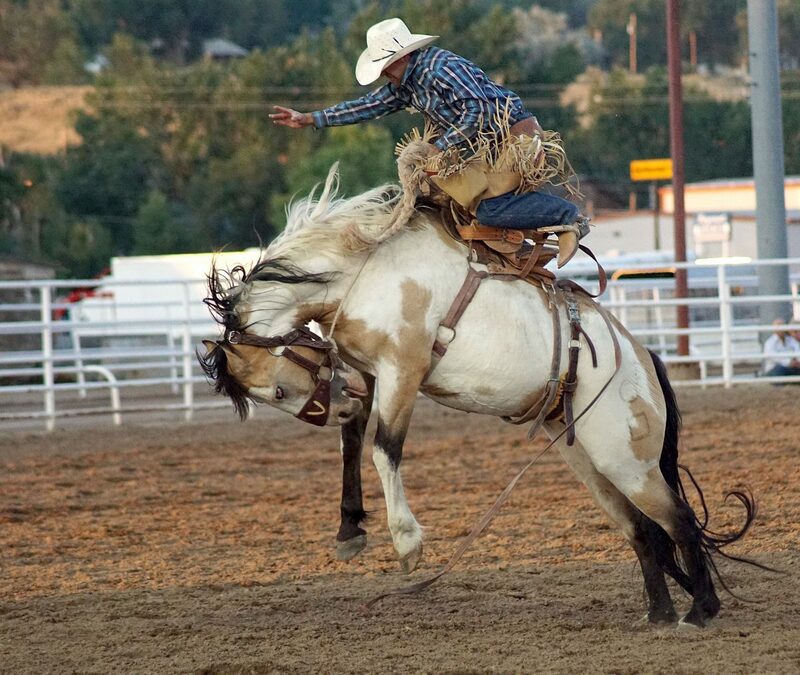 The fourth annual Ridin' & Riggin' Days at the 2018 Moffat County Fair got off to a rocking start Thursday with the bronc riding event. 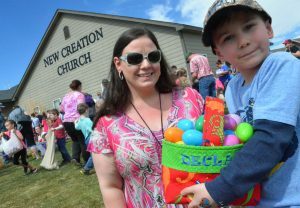 See more photos from the fair online at CraigDailyPress.com. 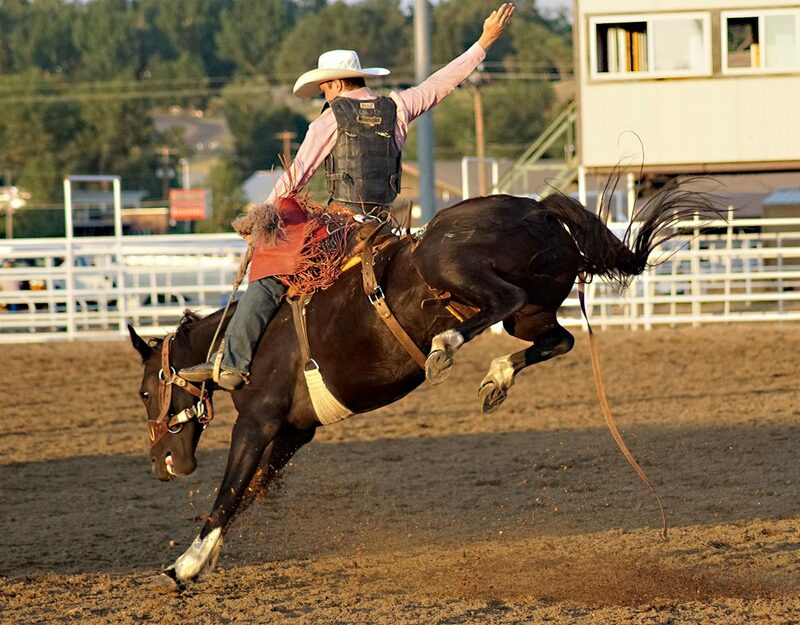 A saddle bronc rider works hard to keep his mount. 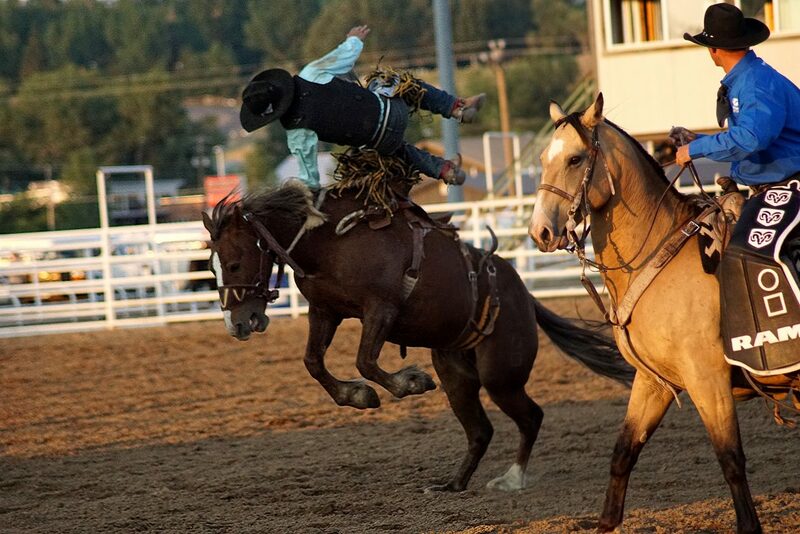 A cowboy loses his seat during the saddle bronc competition. 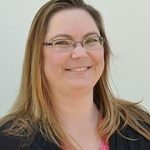 CRAIG — A tug on the rope, and the gate opened, unleashing more than a ton of muscle and bad attitude, all focused on unseating the cowboy clinging to his back. 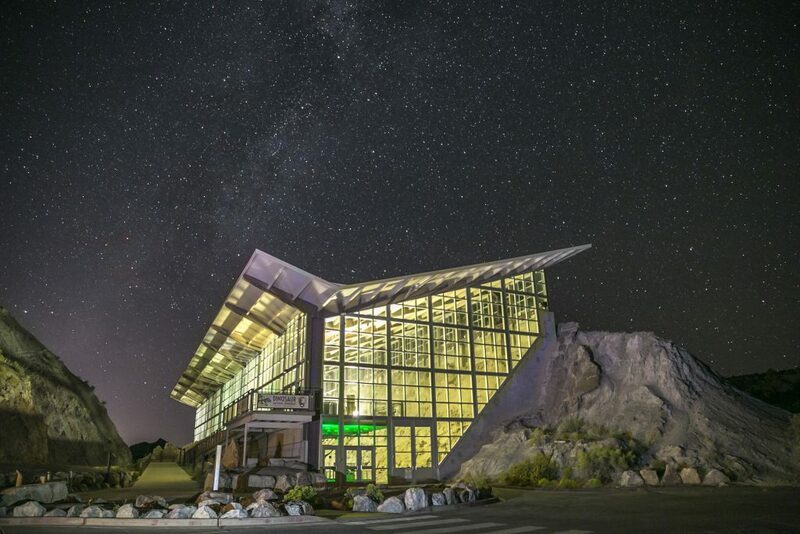 Spit flying, the rodeo bull contorted its body, throwing first its front end, then its back, into the sky, twisting itself into seemingly impossible shapes. 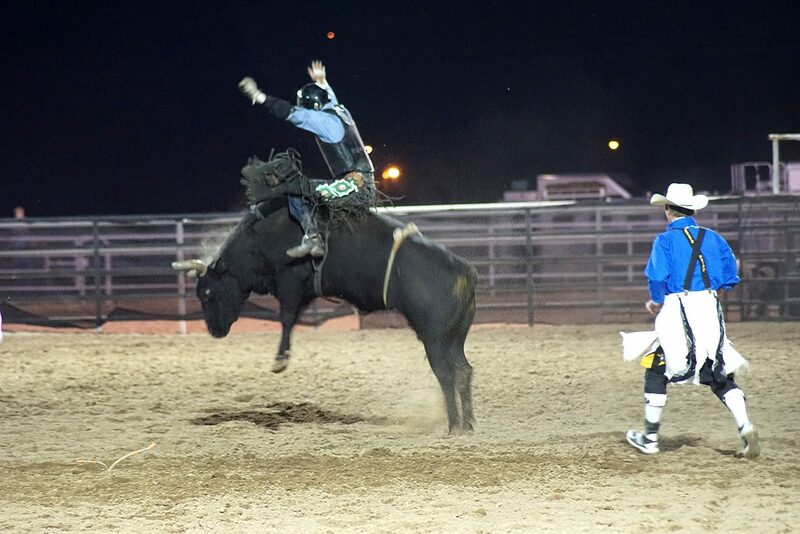 The cowboy, meanwhile, seemed to levitate just above its back. In the first few seconds, it seemed that Dalton Sonenstahl, of Big Lake, Minnesota, might win the battle of brawn versus instinct and skill, but then, with a wicked lurch, Graystone — the Triple V Rodeo bull — threw the cowboy high into the air. 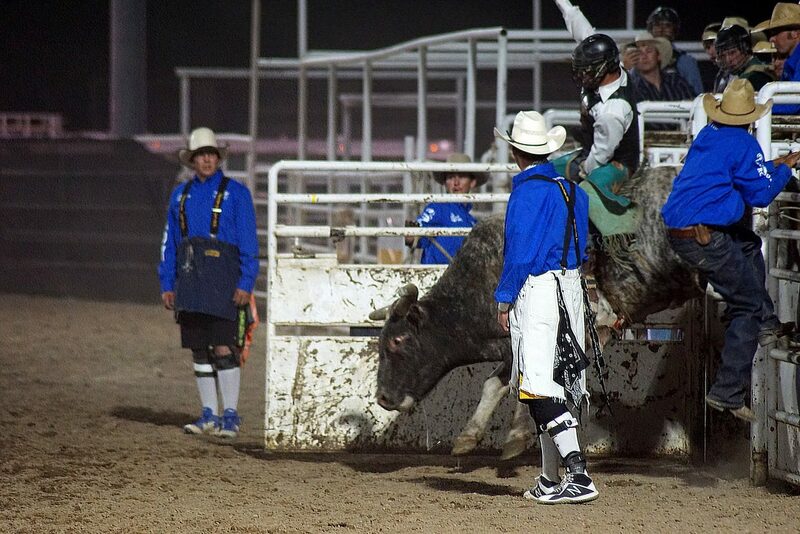 Sonenstahl hit the arena dirt between the chutes and the angry bull. The aggressive animal struck out with a hoof, and the cowboy went down again. A crew of gate and pickup men pushed the bull away, grabbing the cowboy and rushing him to safety behind the chutes. 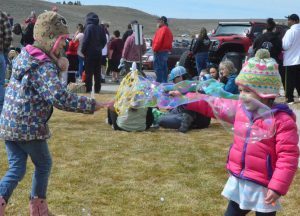 Moffat County Emergency Medical Reserves — one of the many local law enforcement agencies who had been honored only moments before — sprang into action. 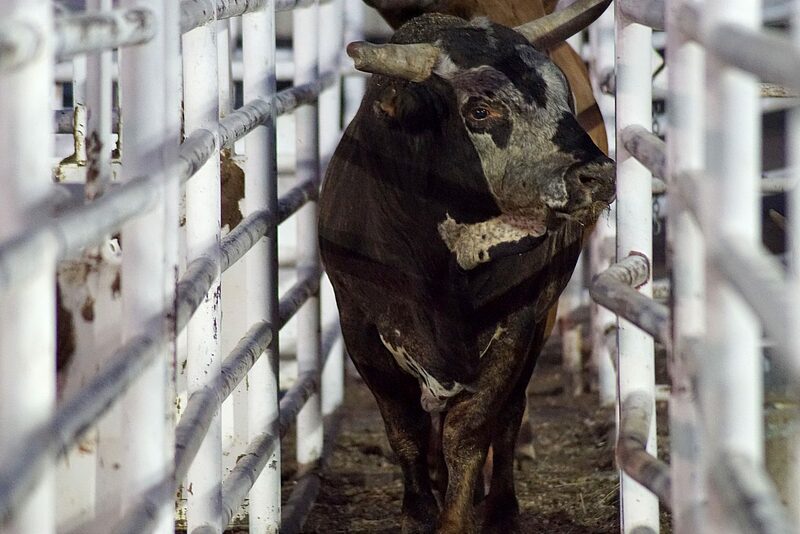 Sonenstahl was not seriously injured, but the bull had thrown him before the buzzer, sending the cowboy home without a qualifying ride and with a lacerated forehead for his trouble. 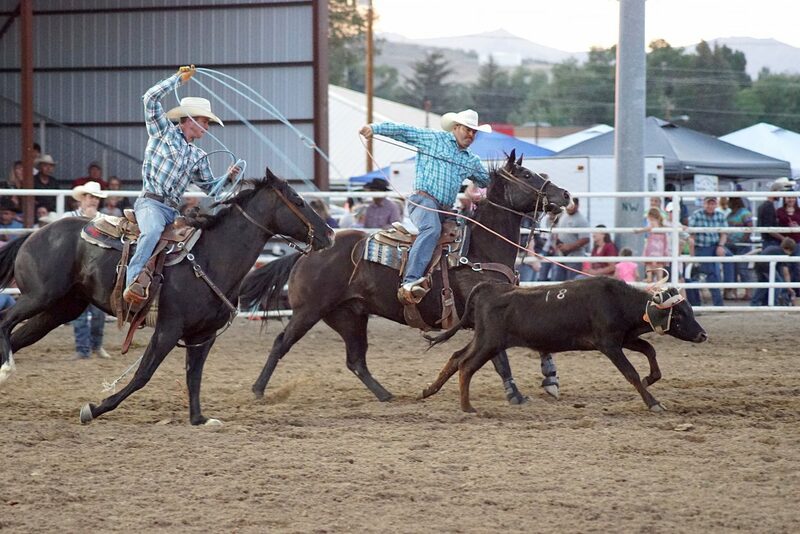 This was one of many events that thrilled the crowd Thursday, Aug. 9, during the fourth annual Ridin’ & Riggin’ Days at the 100th Moffat County Fair. 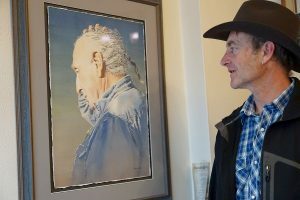 For the second consecutive year, Craig experienced the excitement of a rodeo sanctioned by the Professional Rodeo Cowboy’s Association and the Women’s Professional Rodeo Association. Also returning for the second year were stock contractor Triple V Rodeo, official John Helfrich, timer Tera Anderson, bullfighter Kyle Magee, chute boss Dona Vold Larsen, flankman Bill Larsen, and pickup man Dalton Ward. 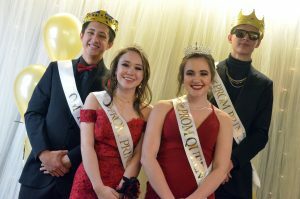 They were joined by official Beaver Segotta, timer Doris Mayhan, announcer Garrett Yerigan, bullfighter Wyatt Mason, and pickup man Duane Gilbert. 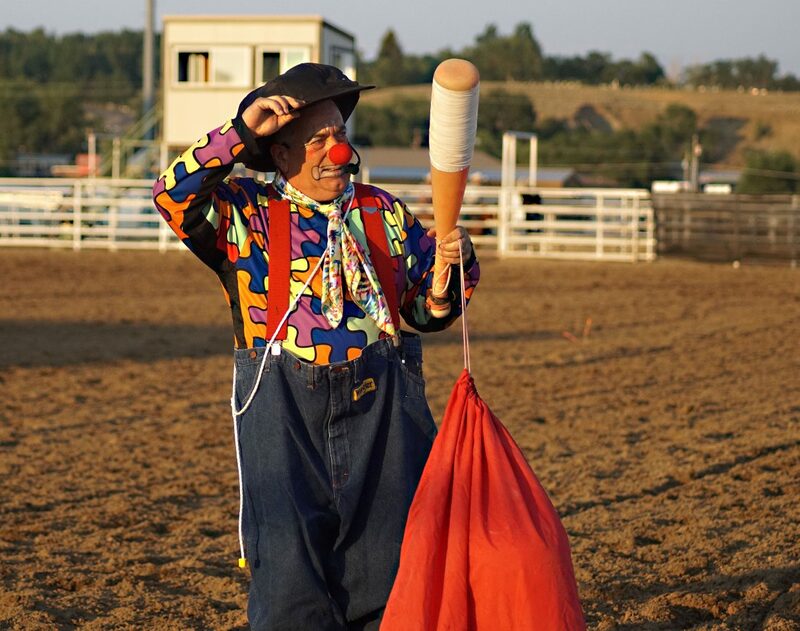 Between events, entertainment was provided by clown/barrelman Donnie Landis and music director Derek Barton, who Yerigan said formerly lived in Craig. 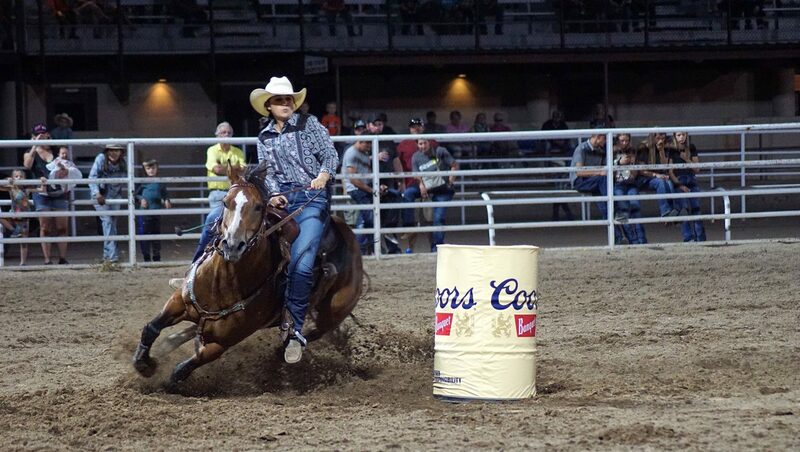 Four competitors originally from Craig put heart into their rides in front of a hometown crowd. 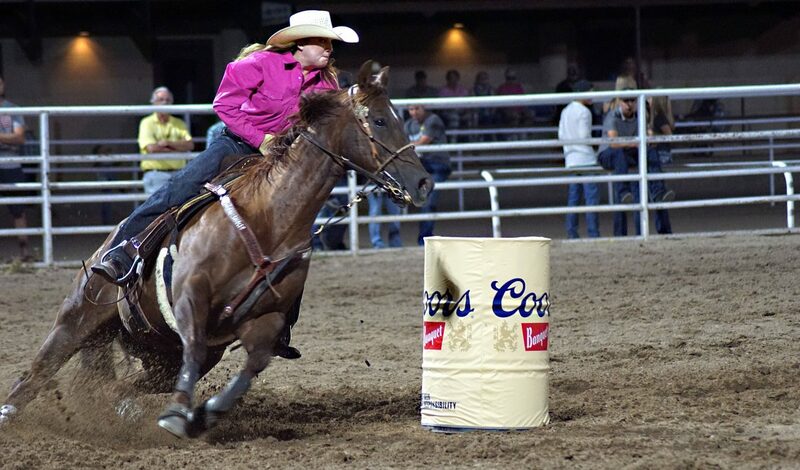 Wendy McKee placed fifth in barrel racing. 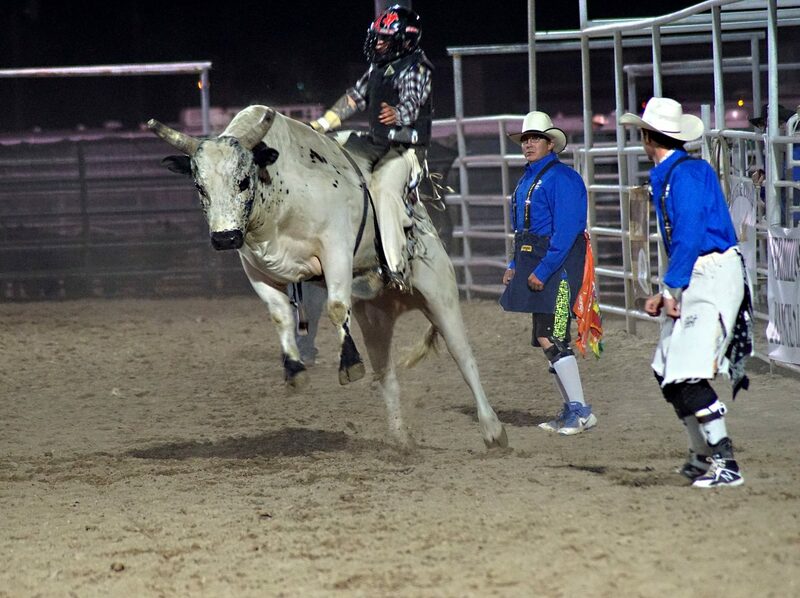 Garrett Buckley was listed in the program but was not present to put in a ride in the saddle bronc competition due to an injury sustained at a rodeo in July. 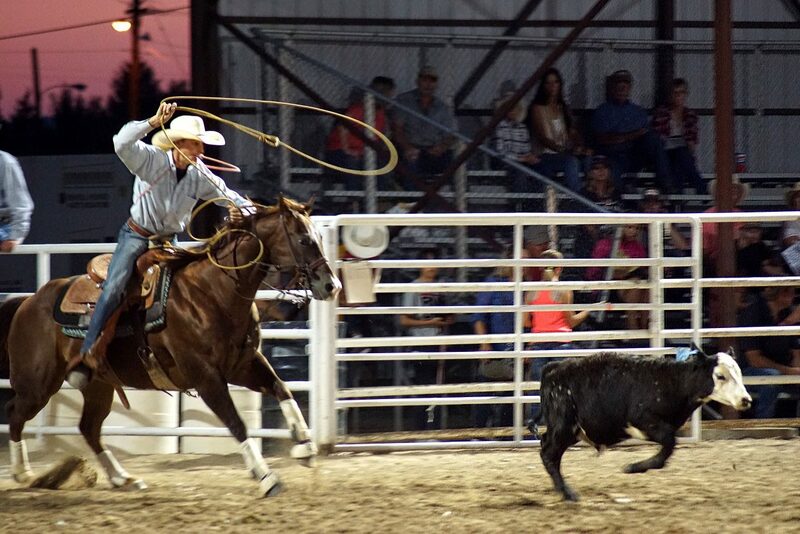 Denton Taylor — one part of a pair of team ropers — and his team roping partner were unsuccessful in scoring. 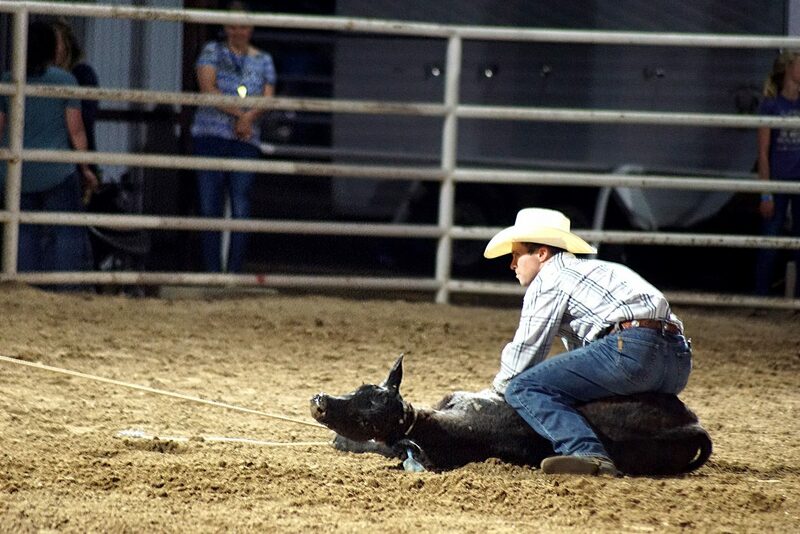 Wyatt Uptain placed third in tie-down, but was unable to produce qualifying rides in either the saddle bronc or the bull riding competitions, leaving the door open for Brady Thurston, of Lance Creek, Wyoming, to win All-around Cowboy, and a $470 bonus, for his performances in saddle bronc riding, tie-down roping, and steer wrestling. 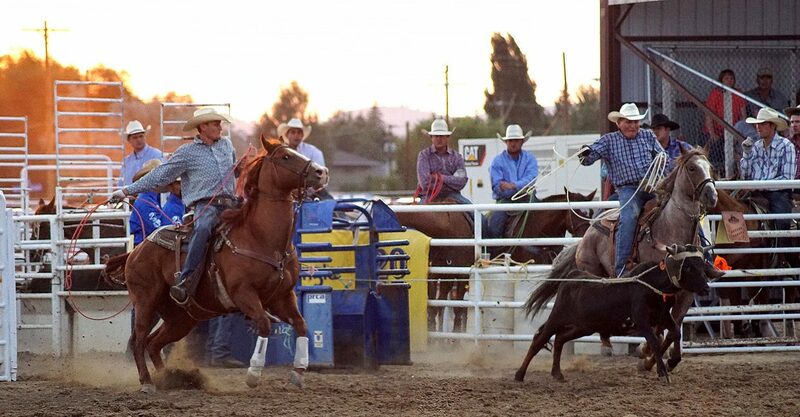 The events paid out a little less than $22,000 in prize money and helped some of the athletes move up or secure rankings on regional and national rodeo circuits. In the rough stock competitions, half the points are awarded to the cowboy and half to the animals, Yerigan said. Therefore, the contractor and animal’s name appears for each first place winner in those categories.